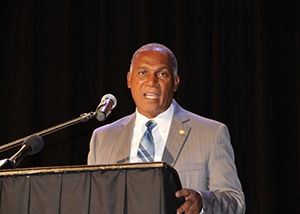 NIA CHARLESTOWN NEVIS (October 20, 2014) — Premier of Nevis and Minister of Finance Hon. Vance Amory believes that education and health are areas critical to the expansion of opportunities that would facilitate the island’s long-term prosperity and equity. Mr. Amory made the comment when he delivered the feature address at the Consultation. It was held at the Michael Herald Sutton Auditorium at the Nevis Performing Arts Centre (NEPAC). The theme was “Expanding Opportunities for Prosperity and Equity.” The forum was designed for a comprehensive dialogue between the public and private sectors as a means to harness information relevant to the development of Nevis. “This new year we began in this new school year but in the new fiscal year-January to December, we will see Technical Vocation Education Training (TVET) education, training for skills development, becoming a much more prevalent aspect of our education and training, so that those persons who may have left school, whether they have 10 O’Levels or no O’Levels but they want to pursue training for self-development, to seek new avenues of employment, that they can do so through our TVET education programme which I believe is critical, not just to Nevis but to the whole region, developing skills,” he said. The Minister of Finance spoke about ongoing projects at the Four Seasons, Mount Nevis and a new project Fisherman’s Cabana at Jessups village. He explained that in a recent meeting with the developers of Fisherman’s Cabana, it was revealed that construction would commence soon. “I have been assured, providing all goes well, that by the new year, no later than February, we shall have ground breaking for that project and in discussing with the principal of that project, he indicated that he would want to complete it within a maximum of 15 months and I said ‘how will you do that?’ and his strategy is, ‘we will provide, instead of one main contractor who will be looking at everything, the different units will have their own contractor/ supervisor dealing with the development’, which is a good strategy. “Instead of dragging out the project, get it done, get the facility so that we can have employment. We can have the take out from it in terms of the revenue for government, social security and so on because these things all dovetail one into the other and must be seen as one whole concept rather than segregated concept,” he said. In the area of health, Mr. Amory noted that as part of the overall strategy for long-term development of the economy it was a key area that had to be developed. “As a high-end tourism destination, we have to be very mindful that the people who come to our shores and whom we want to continue to attract, are accustom to a certain quality of service but a certain quality of health service and access to that service. “We need to see health services development as a critical aspect of our development long-term, providing opportunities and not just opportunities for “on land” treatment or for people who just visit but to link this in to health tourism,” he said. The Finance Minister further added that there were two health related projects planned for the Nevis. “I can say without giving any specifics that we have two projects which will be based at already established facilities, so we don’t have to get somebody to come in to set up a new facility physically. “The object is that these facilities will market themselves and go out and reach for their clientele, so that they can grow their business and also contribute to the development of health tourism for our people,” he said.